Rachel Meigs Joyce, 93 of Enfield passed away on Thursday, January 24, 2018. 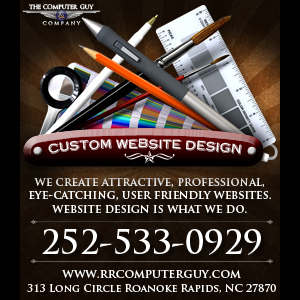 She was born in Stanley County, North Carolina, to the late Joseph Carl and Lola Vann Eddins Meigs. She was also preceded in death by her husband, Charles “Buddy” DeCou Joyce, Jr.; sisters Sarah Morgan, Mary Honeycutt, and Gertrude Venters; and brother Joseph Carl Meigs, Jr.
Rachel, along with her husband, owned and operated Buddy Joyce Motors in Arlington and Falls Church, Virginia. She was a dedicated member of Westover Baptist Church in Arlington, Virginia, where she served as church pianist and children’s Sunday School teacher. An accomplished musician, she attended Women’s College in Greensboro, now UNC-Greensboro. For several years she was the house mother for the Middle School at Fork Union Military Academy in Fork Union, Va. After moving to North Carolina, she used her musical talents as assistant pianist at Antioch Baptist Church. In addition to music, her hobbies included sewing, hooking rugs, and playing Scrabble. She is survived by her daughter, Lola M. Hollenbeck and her husband, David, of Springfield, Virginia; her sons, Christopher M. Joyce and his wife, Susan, of Enfield, North Carolina, and Charles D. Joyce, III and his wife, Mary, of Southport, North Carolina; her five grandchildren, Alex Hollenbeck, Christine Hollenbeck, Peyton Joyce, Justin Joyce and Collin Joyce; numerous nieces and nephews; and her beloved care-giver, Cindy Adkins. Graveside Services will be held in the Columbia Gardens Cemetery in Arlington, Virginia, at 1:30 P.M. on Wednesday, January 30, 2019 with Rev. Susan Joyce officiating. 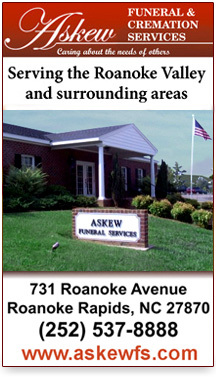 Arrangements are in the care of Askew Funeral & Cremation Services. Condolences may be made to the family at www.askewfs.com. In lieu of flowers, donations may be made to Community Home Care and Hospice (112 Long Circle, RR, 27870) or Alzheimer’s Association (225 N. Michigan Ave. Floor 17 Chicago, IL 60601 or online: www.alz.org).